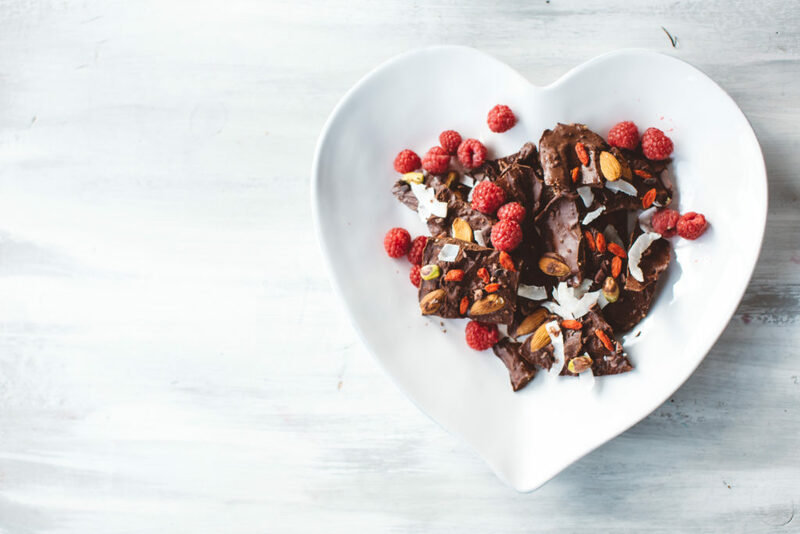 I love this recipe because it means I can get my raw chocolate fix quick! Plus, it looks really impressive, so it’s great for a dinner party dessert. Your guests don’t need to know it was really easy to make! Melt coconut oil in a pan on the stove. Remove from heat, stir in cacao powder, sea salt and maple syrup. Allow the mixture to sit and cool in the fridge for at least 5-10 minutes so that it starts to thicken a bit. While the mixture is cooling, line a plate, baking sheet or Tupperware with parchment paper. Once mixture has cooled and thickened, pour over parchment paper. Top mixture with your choice of things like chopped nuts, seeds, dried fruit, frozen berries, coconut, etc, using about 1-2 tablespoons depending on how many toppings you use. Place chocolate in fridge or freezer to harden. Once hard break into pieces and enjoy.